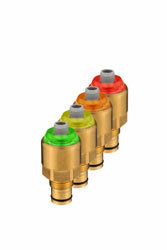 RINA- and UL-approved sensor with a multicolour LED light for accurate indication of the degree of filter clogging. Euroswitch, the leading sensor manufacturer based in Sale Marasino, Brescia, Italy, has just launched on the market the new Differential Indicator with Led Lights model 983, which was conceived to indicate the degree of clogging of a filter element with the highest level of accuracy. The main feature of this innovative product , which is intended for use in filter systems, consists of an illuminated dome, the colour of which is associated with different degrees of filter clogging. This allows you to “discreetly” monitor the state of filter elements very clearly and accurately and also “set” the indicator to the desired threshold. The 983 Differential Indicator is wired using an M12 connector. This helpful tool allows the user to visually check the degree of clogging and choose different thresholds to be matched with different colours. The sensor body comes in brass or AISI 316 steel, IP67 rating, and complies with UL-listed process marking. The new Differential Indicator with Led Lights 983 can be supplied on request with RINA CERTIFICATE OF APPROVAL, i.e. a Safety Certificate issued by the Italian Naval Register, which certifies compliance with the international standards required for the nautical industry. Special versions, with different materials and/or wiring connections, are available for this latest-generation indicator as well.